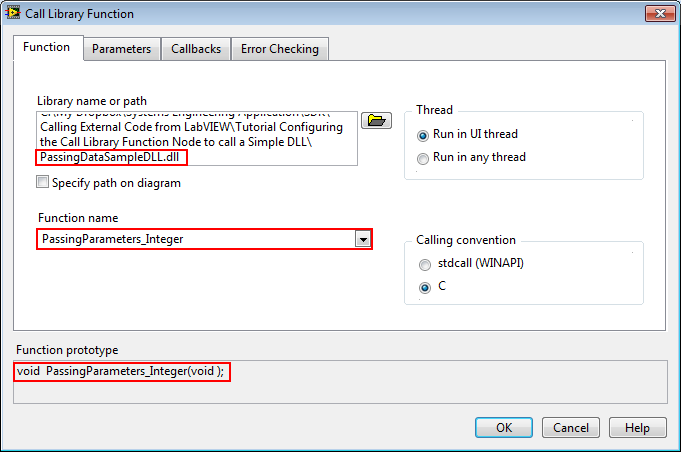 This tutorial walks you through the process of dropping and configuring a Call Library Function Node to call a simple C/C++ DLL from LabVIEW. This function returns the sum of the two numbers, x and y, that are passed as parameters. On the Function tab, click the Browse button next to the Library name or path and browse to the sample DLL, PassingDataSampleDLL.dll. 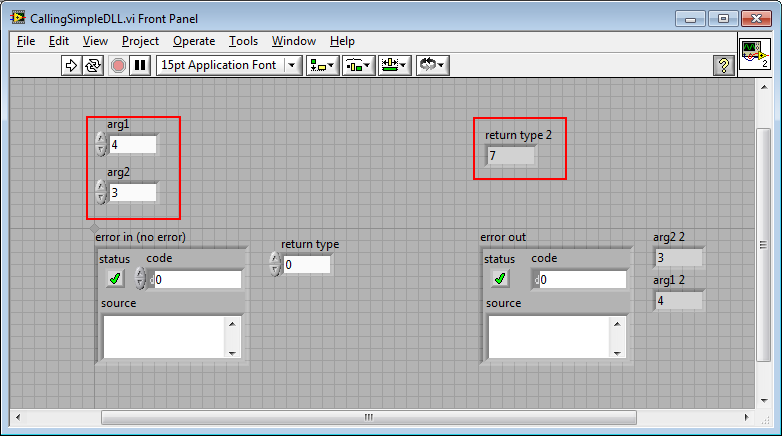 This will populate the Function name dropdown box with the functions available in this DLL. 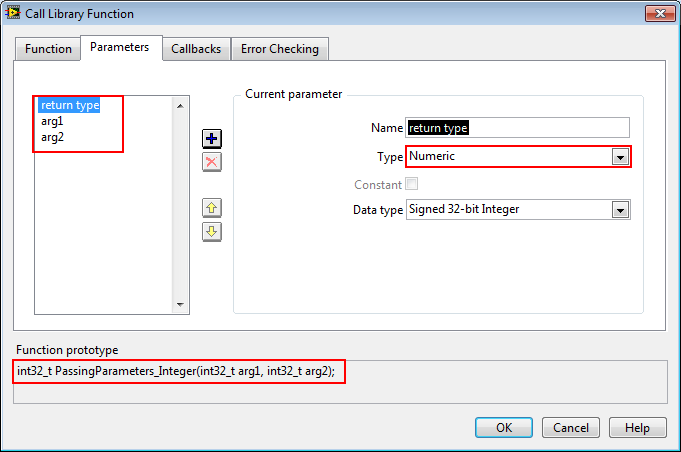 Select the PassingParameters_Integer function from the Function name dropdown box. Your Function tab should look as follows. Note that the function prototype does not match what our function actually accepts. We will fix this in the next couple of steps. This will create a new parameter called arg1 that defaults to an Int32 passed by value. This is exactly what we want to leave the defaults. Note: You can rename the argument name if you would like, this will not affect the way the DLL is called. Your Parameters tab should look as follows. Note that the function prototype now matches the actual prototype of our function in the DLL. Change the values for the controls arg1 and arg2, and click the Run button. 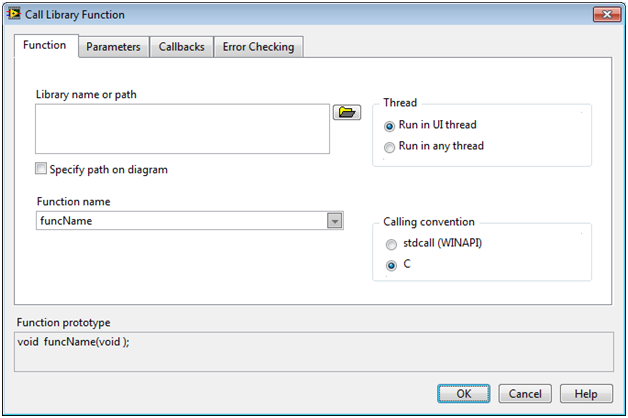 You have learned how to call a C/C++ function in a DLL from LabVIEW using the Call Library Function Node. 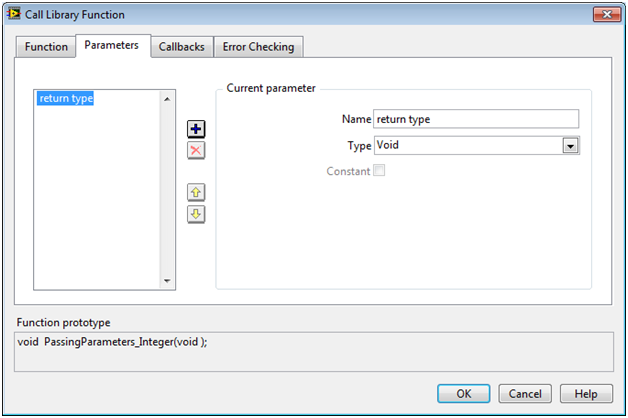 You can call more advanced functions as well using the Call Library Function Node by varying the options in the Call Library Function Node’s configuration dialog. The Import Shared Library Wizard can automate a lot of the effort involved in calling C/C++ DLLs by creating wrapper VIs with configured Call Library Function Nodes that you can call from your VIs. The library selected is not valid for the current platform. For example, you are running 64-bit LabVIEW and the library might be a 32-bit library. I am indeed running a 64-bit LabVIEW. Is there also a 64-bit version of the sample DLL 'PassingDataSampleDLL.dll' or does there exists a workaround? Nothing prevents you from also installing LabVIEW 32bit and use that. I guess that's a "workaround". Is there any particular reason you absolutely need 64bit?